Gilder Lehrman Collection #: GLC00377 Author/Creator: Nicholls, Richard (1624-1672) Place Written: s.l. Type: Manuscript document Date: 29 September 1664 Pagination: 6 p. : docket ; 30 x 19 cm. Summary of Content: Co-signers of original are listed at end, including: Robert Carr, Connecticut Governor John Winthrop, Samuel Willis, George Cartwright, Thomas Larke, John Pricham, Johan I Dechere, Nicholas Barlet, Samuel Mogapolonsio, Cornolis Sterunyck, Oloft Stopons Van Cortland, Jacquios Coussuan. Twenty-three articles stating the properties and rights of the new governance of New Amsterdam. Partial docket reads "Articles concerning." Background Information: Nicholls was made the first English governor of the provinces of New York and New England in 1664 but spent most of his time in New York. Although he took on ...a great deal of authority, he exercised strong leadership and governed fairly causing the colonists of New York to hold him in high regard. He died in battle during the Third Dutch War in 1672 when he volunteered to serve in the English fleet. 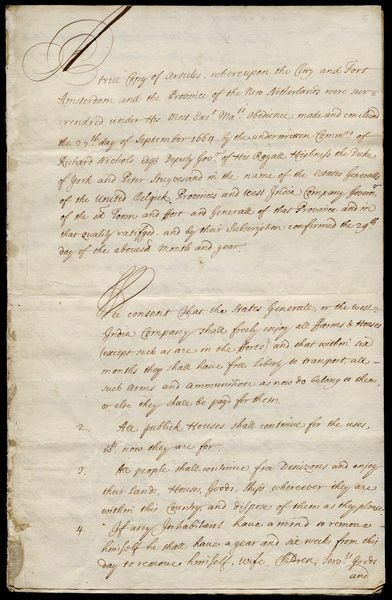 Full Transcript: True Copy of Articles, whereupon the Citty and Fort Amsterdam and the Province of the New Netherlands were surrendered under His Most Exct. Mat's. Obedience, made and concluded the 27th. ...day of September 1664. by the underwritten Commrs. of Richard Nichols Esqr Deputy Gov.r of His Royal Highness the Duke of York and Peter Stuyvesand in the name of the Estates Generalls of the United Belgick Provinces and West India Company Govern.r of the sd Town and ffort and Generall of that Province and in that quality ratified, and by their subscription confirmed the 29.th day of the abovesd Month and year. Wee consent that the States Generall, or the West India Company shall freely enjoy all ffarms & Houses (except such as are in the fforts) and that within six months they shall have free Liberty to transport, all such arms and ammunition as now do belong to them, or else they shall be payd for them. 2. All publick Houses shall continue for the uses, wch. now they are for. 3. All people shall continue free Denizons and enjoy their Lands, Houses, Goods, Ships, wherever they are within this Country, and dispose of them as they please. 4. If any Inhabitant have a mind to remove himself he shall have a year and six weeks from this day to remove himself, Wife, Children, Servts. Goods and  and to dispose of his Land here. 5. If any officer of State of publick Minister of State have a mind to go for England they shall be transported fraught free in His Ma.t's ffriggatts, when those ffriggats shall returne thither. 6. It is consented to, that any people may freely come from the Netherlands and plant in this Country; and that Dutch Vessells may freely come hither, and any of the Dutch may freely return home, or send any sort of Merchandises home in Vessells of their own Country. 7. All ships from the Netherlands or any other places, and goods therin, shall be received here & sent hence, after the manner, wch. formerly they were before our coming hither for six months next ensuing. 8. The Dutch here shall enjoy their Liberty of their Consciences in Divine Worship and Church Dissipline. 9. No Dutchman here or Dutch Ship here shall upon any occasion be prest to serve in Warr against any Nation whatsoever. 11. The Dutch here shall enjoy their own Customes concerning their Inheritances. 12. All publick writings and Records wch. Concerns the Inheritances of any people, or the Regulment of the Church or Poor or Orphans shall bee carefully kept by them in whose hands now they are, and such writings as particularly concern the states generall all may att any time be sent to them. 13. No Judgement that hath passed any Judicature here shall be called in question, but if any conceive that he hath not had Justice done him, if hee apply himself to the states Generall, the other party shall bee bound to answer for the supposed Injury. 14. If any Dutch living here shall att any time desire to travell or traffique into England or any place or Plantation in obedience to His Maty of England, or with the Indians he shall have (upon his Request to the Govr.) a Certificate that he is a free Denizon of this Place, and Liberty to do so. 15. If itt do appear that there is a publick ingagement of Debt by the Town of Manhatons, and a way agreed on for the satisfying of gt engagement. It  It is agreed that the same proposed shall go on and that the engagement shall bee satisfied. 16. All inferior Civill officers and Magistrates shall contrive as now they are (if they please) till the customary time of new Elections; and then new ones to be chosen by themselves Provided that such new [struck: ones] Magistrates shall take the Oath of Allegiance to His Maty of England before they enter upon their office. 17. All Differences of Contracts and Bargains made before this day by any in this Country shall bee determined according to the manner of the Dutch. 18. If it do appear that the west India Company of Amsterdam do really ow any Summs of mony to any persons here, itt is agreed that Recognition and other Duties payable by Ships going for the Motherlands, bee continued for six months longer. 19. The officers Military & Soldiers shall march out with their Armes, Drums Bating and Colours flying, and lighted matches; and if any of them will plant they shall have fifty acres of Land sett out for them; if any of them will serve any as Servants they shall continue with all safety and become free [Denisons] afterwards. 20. If at any time hereafter the King of Great Britaine and the States of the Motherlands do agree that this place and Country be redelivered into the  the hands of the said States whensoever His Maty will send His Commands to redeliver itt, itt shall immediately be done. 21. That the Town of Manhatons shall choose Deputies and those Deputies shall have free [vogues] in all publick affairs as much as any other Deputies. 22. Those who have any propriety in any Houses in the ffort of [aurania] shall (if they please) slight the ffortifications there, and then enjoy all their houses as all people do where there is no ffort. 23. If there be any Soldiers that will go into Holland and if the Company of West India in Amsterdam, or any private psons here will transport them into Holland, then they shall have a sage Passport from Coll Richard Nicholls Deputy Governr. under His Royall Highness, and the other Comm.rs to defend the ship that shall transport such Soldiers, and all the goods in them from any surprizall or Acts of Hostility to be done by any of His Ma.t's Ships or Subjects. That the Coppy of the Kings grant to His Royall Highness, and the Coppy of His Royall Highness Commission to Coll Nicholls testified by two Comm.rs now and Mr. Winthrop to be true Coppies shall be delivered to the Honble Mr. Stuyvesant the present Governr. on Munday next by sight of the  the Clock in the morning at the old Milne and these Articles consented to, and signed by Coll Richd. Nicholls Depty Governr. to His Royall Highness, and that within two hours after the ffort and Town called New Amsterdam upon the Isle of Manhatons, shall be delivered into the hand. of the sd Coll Richard Nicholls by the Service of such as shall be by him thereunto deputed by his hand and seal. articles Richard Nicholls. Robt. Carr.